← Where Did Summer Go? My first recollection of cumin in a fragrance was Le Labo’s Rose 31. It confused me early on as I found its warm, sweaty body order like smell jarring. When I realized it was supposed to be there, the scent grew on me. and it has become one of my favorite scents. Saffron caught my attention when I was in Paris a few years ago and sampled L’Artisan’s Safran Troublant at the Lourve. Its sweat heat was an instant win for me. Both cumin and saffron are prevalent in the opening of Amouage’s Fate Man, which not only caught my attention but has continued to excite my olfactive bulbs. Fate Man for me has been a troubling scent. Every time I’ve worn it, I realize another layer and for that reason, I appreciate its craftsmanship. The very first time I wore it, I picked up the cumin and saffron right away in the top notes and they pretty much overshadowed everything else. On another wearing, about four hours or so after applying it, I was in awe that my nose picked up the floral notes in the middle. I surely didn’t think it would go there after the pungent opening I experienced and that dramatic shift impressed me. I have since recognized there’s more going on in Fate Man’s opening and that tug of war between the freshness of mandarin and the zestiness of ginger and the animalic presence of cumin piques my interest. I should footnote here that my early test of Fate Man occurred in the middle of the summer and perhaps that heat agitated the cumin enough that it presented itself in stereo while the other notes were in analog. If you’re a fan of Amouage’s collection of fragrances, you’ll recognize that Fate Man fits the story they’ve been telling. Their use of pungent spices, incense and woods has become defining traits of the brand. But Fate Man illustrates what I love about perfumery – just when you think a scent has flattened out, an interesting twist occurs and wakes you up. The right turn it takes in the middle was such a surprise for me that it sealed the deal on how I feel about it. On top of that, its longevity is superb. If Fate Man is your first encounter with Amouage, the amount of cumin you detect could affect your perception of this scent as it can be a polarizing note. In other reviews I’ve read, it would appear cumin played it’s part as opposed to my experience where it played an extended solo. 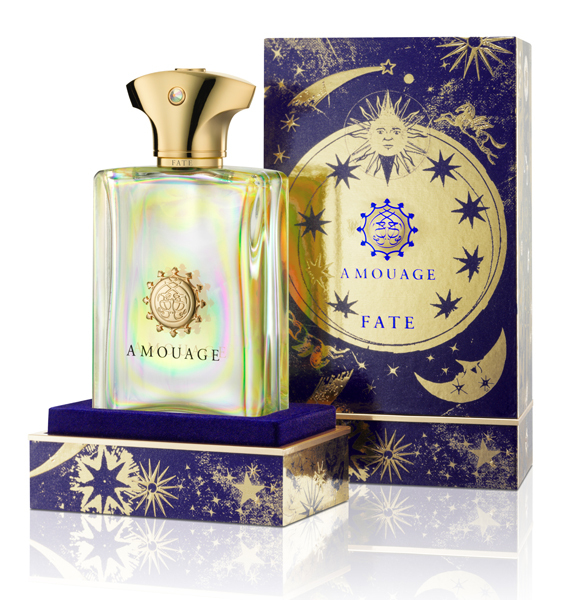 Nevertheless, I suspect Fate Man will do well for Amouage and I look forward to the next chapter in this ongoing story Christopher Chong is superbly narrating. Fate Man – 50ml – $280. This entry was posted in Fragrance Review and tagged Amouage, Christopher Chong, details, Fall Fragrances, Fragrance Review, L'Artisan, Le Labo, men's cologne, Rose 31, Safran Troublant. Bookmark the permalink. This is a nice perfume though a bit costly. I decided to give it a try after reading reviews from http://perfumereviewguide.com/amouage-fate-man-and-woman-perfume-review/ and I am satisfied with my choice.